Emilie Wapnick is a speaker, career coach, blogger, and community leader. She is the founder and creative director at Puttylike.com, where she helps multipotentialites integrate all of their interests to create dynamic, fulfilling, and fruitful careers and lives. Unable to settle on a single path, Emilie studied music, art, film production, and law, graduating from the Law Faculty at McGill University in 2011. Emilie is a TED speaker and has been featured in Fast Company, Forbes, The Financial Times, The Huffington Post, and Lifehacker. Her TED talk, “Why Some of Us Don’t Have One True Calling,” has been viewed over 3.5 million times, and has been translated into 36 languages. She has been hired as a guest speaker and workshop facilitator at universities, high schools, and organizations across the United States and internationally. “We are all unique, so why does there only seem to be one path towards success? How to Be Everything throws out this one-size-fits-all approach and explains how to make our diverse skills sets work for us. 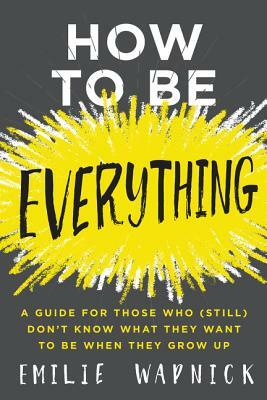 How to be Everything helps you understand and process your diverse skills so you don’t have to sacrifice your potential. This book will help you fulfill your biggest dreams; all of them!